Confidex announced that its RFID windshield labels are being used to support India’s modernizing of all border checkpoints as mandated by the government, with the first fully automatic border control system kicking off in Maharashtra, India. Maharashtra State Road Development Corporation (MSRDC) is in the process of modernizing the state’s border checkpoints utilizing passive ultra-high frequency (UHF) RFID based automatic vehicle identification (AVI) technology that enables both reliable large scale vehicle and traffic management as well as enhanced traffic flow. 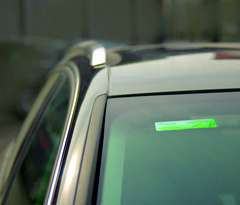 The Confidex windshield label is issued and affixed on each vehicle’s windshield and automatically read when the vehicle approaches the checkpoint. The required vehicle information; tax, insurance, permit, pollution and driver, is instantly retrieved from the central database. In the past, formalities were manually processed resulting in high processing times and traffic jams at the stations. This new solution allows border officers to make quick decisions regarding the border control, resulting in improved experience for both the driver and border officer.